Both Samsung and Panasonic are huge, well-known mega-companies. Both make lots of different stuff. Panasonic Corporation used to make bicycles, makes every kind of imaginable electronics, and even acts as a mayor sponsor in Formula 1. The Samsung group is even more diverse, making electronics, ships (yes – those big things sailing the world’s oceans) and even being involved in construction as well as soccer and Olympic sponsorship. You could think that this lack of (ahem) “focus” would make them bad at producing cameras, but then you could be wrong. Panasonic came to the digital camera party around 2001, which is later than the classical photographic big boys such as Nikon and Canon. Sure, they’re Japanese, and the Japanese have a knack for making good cameras. But they had to be content with a teeny tiny market share compared to the big boys, who were solidly into digital photography by the mid 90’s. 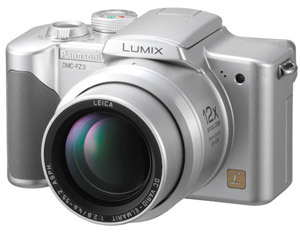 The Lumix FZ3 was the first Panasonic camera to catch my eye. Great lens, and great ergonomics. Panasonic cameras started catching my eye around 2004, when they came out with the FZ-3: the third in a series of compact and affordable 12x superzooms sporting excellent image stabilised Leica lenses. More importantly, they got the ergonomics right. They only had one (big) problem – they were light years behind in sensor design. Their images showed diagonal jaggies, and were oh-so-noisy. That didn’t stop me from buying a FZ-5 in 2005, which lured me with it’s portability, good ergonomics, and great lens. However I soon sold it to a friend after finding the noise, mediocre colour rendition, and occasionally still visible diagonal jaggies too distracting. By comparison my old Canon S45 (from 2003) had great colour and much less noise. So much for the great lens. But as time went by, Panasonic kept on evolving. They tried some new things. As a member of the Four-Thirds consortium they tried their luck at making an SLR, the Lumix L10, which wasn’t such a success. Their image quality kept on improving, and they kept on offering interesting models with great lenses and great ergonomics. Then came some blockbusters. They started offering a whole range of compacts with proper wide angle (28mm or less) zoom lenses. The beautifully retro-styled LX3 has an astounding 24mm f/2.0 stabilised lens and slightly-larger-than-average sensor. And then, bam, came the G1, GH1 and GF1: flagships of the new micro-four-thirds standard with excellent performance and glowing reviews. 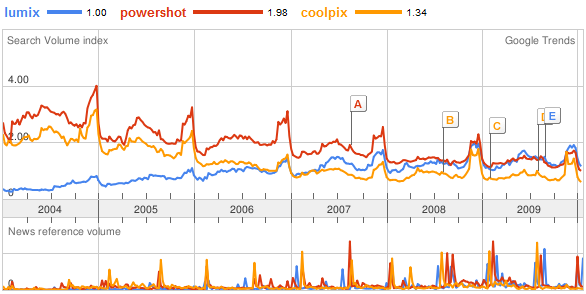 The Panasonic "Lumix" range is hot, while Canon "Powershot" and Nikon "Coolpix" see demand cooling. If you look at Google Trends, you will even start to believe than Canon and Nikon should take a deep hard look at themselves and ask where it is that they dropped the ball. Panasonic moved from being an underdog with well-thought-out albeit flawed cameras, to a trend-setting photography giant who is changing the industry. I think it started with getting the ergonomics right – your best camera is always the one you have with you. And Panasonic made it fun to have you camera with you. Samsung came to the digital camera party in 2002 – even later than Panasonic. Being non-Japenese and non-German they didn’t have much of a reputation to build on. Predictably they first tried to make cheap compacts, since those are easy, and people aren’t as critical as far as the quality is concerned. A good image starts with a good lens. Just like Panasonic (and Sony), Samsung tried to bring some prestige into their brand by pairing up with a prestigious lens manufacturer, Schneider-Kreuznach. This wasn’t all that original, since Sony did it with Carl Zeiss and Panasonic did it with Leica. Despite the name-dropping, Samsung’s first cameras were pretty bad. Then Samsung tried to show off some DSLRs. Actually they made a deal with the Pentax (which is Japanese), and started selling a few of their models with Samsung stickers in the front. Sounds whacky? Well, it made them look a bit like the copycats they were, and a.f.a.i.k. it never really got of the ground. But at least they kept on learning. 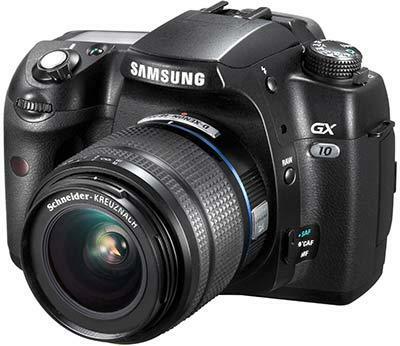 And then, just as micro 4/3 was starting to make waves, Samsung announced the NX system at the PMA2009 trade show. What is the NX system? It is a new lens mount / system offering a 1.5x crop factor APS-C sensor (as found in most Nikon and Pentax DSLRs), but without the mirror box. As I’ve explained in a previous post, the world doesn’t need to be kept chained to the analog era mirror-box design. Micro 4/3 is a brave product for the modern photographic world, but has its limitations. The biggest criticism against micro 4/3 is its smaller (2x crop factor) sensor, which remains noisier than equivalent 1.5x crop factor sensors, while also offering less depth of field control and reduced dynamic range. Samsung seems to have spotted this market gap, and they went for it. 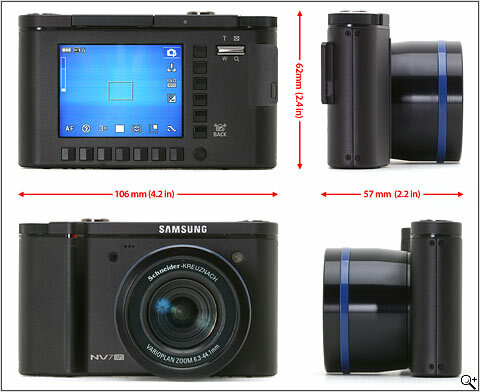 Samsung's NX system is almost like μ4/3, albeit with a larger sensor. Not exactly a new idea, but clever to find a niche by choosing a larger sensor. The first reviews seem to be very positive about the beautiful and discreet 30mm f/2 – one of the first lenses being offered with the NX system. 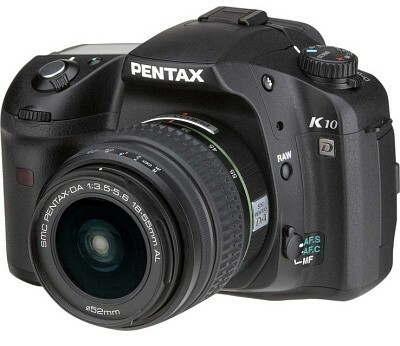 This is a beautifully fast “normal” prime lens (45mm equivalent) – great for street photography and such. Some technology commentators have (rightly) been rather critical about the NX system’s lack of compatibility and slightly ambitious pixel count, and we suspect that Samsung’s sensor technology is probably a step behind the likes of Canon and Nikon. But don’t forget: Panasonic was also there, and they are really going places! 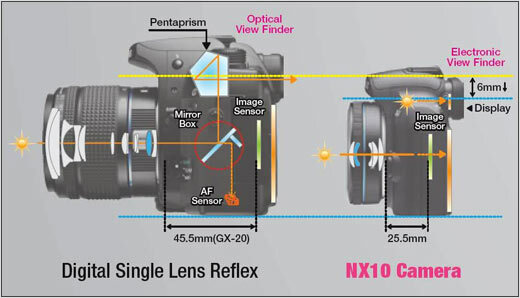 At the very least, you have to praise the NX system for expanding our options, and offering the most compact 1.5x crop factor cameras out there. 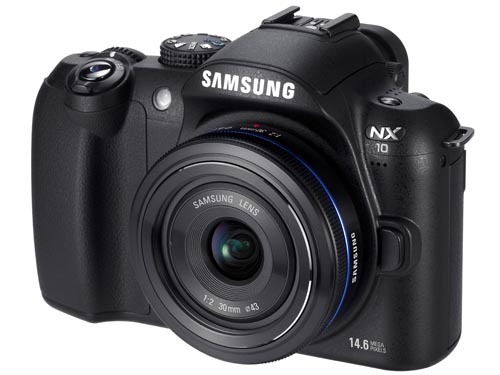 The Samsung NX10 with it's impressively discreet 30mm f/2.0 "pancake" lens. Who's pushing the boundaries now? So, what’s the bottom line? I think you should keep an eye on these guys at Samsung. By focussing on the ergonomics, and making clever optical choices, they’re heading the right way. Finally, Samsung is really starting to push boundaries. Just like Panasonic, they might be able to see their sales grow in these economically unstable times, while the big guns (wink, wink) are clinging to the status quo. Just picked up a Panasonic LX3 a couple of weeks ago for a bargain. Amazing little camera with a very good sensor (for non-DSLR) and an amazing Leica Vario-Summicron 24mm f/2.0 lens. Yes I also have an LX3. Nice little camera, indeed. Not overly impressed with the sensor, considering what Canon did with the S90, but it is certainly a camera I like to take along and which which I take good enough pictures! I thought back to your post here as I looked through a September 1946 “Popular Photography” magazine. This has a shockingly racist and dismissive profile of the postwar”Jap” camera industry (yes I am quoting). The article is liberally sprinkled with words like “crude” and “inferior.” It states, “lack of originality is a mark of Japanese cameras.” The writer misspells “Cannon” and Konishiroku (Konica). He grudgingly admits that one Japanese lens, the oddly-named “Nikkor,” wasn’t bad for an Elmar copy (overlooking that the Elmar was itself a copy of the Zeiss Tessar). Anyway, we all know how THAT turned out. So when I hear people snort “oh Samsung, they make microwave ovens, what do they know about cameras?” I believe it would be a grave mistake to underestimate what they accomplish do eventually. Samsung is the highest-grossing industrial group in the world. It’s #2 in the Korean shipbuilding industry, which now launches more ships than all other countries put together. If Samsung decides to pursue a particular market, they certainly have the resources to make it happen.